The fag end of the winter is the advent of early spring. The weather has still not settled yet. Mornings begin on a bright note and as the day progresses, wisps of clouds float across the firmament and often collect around the mellow Sun and thus another day cold and cloudy. Nature has begun to wear shades of yellow. 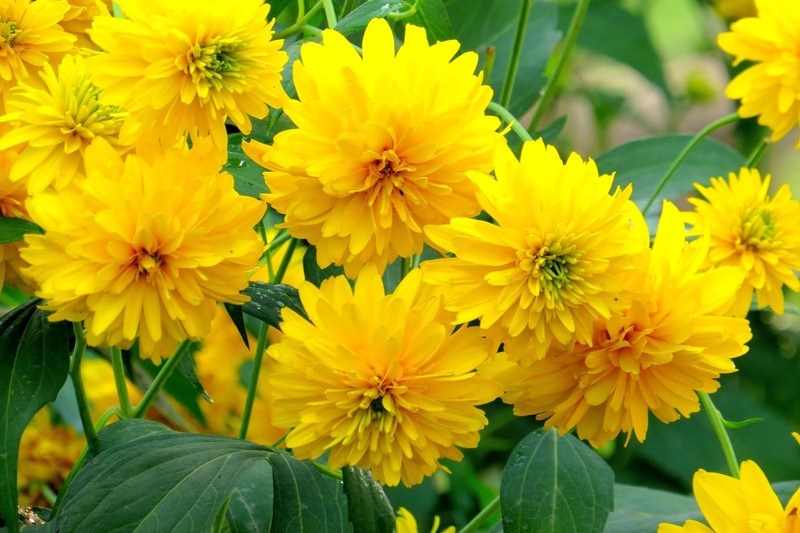 In our culture, yellow symbolizes the arrival of spring. A bunch of wild Dahlias brightens up a corner of the field. 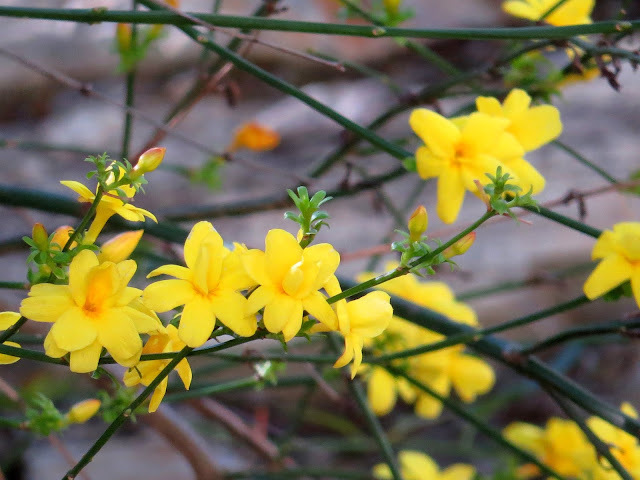 Some scented yellow flowers fill up the vine that was leafless some weeks ago. New buds in the hibiscus attract the butterflies and there are many hovering around, inspecting the buds that have not yet opened their eyes. Evenings are still cold a bowl of hot soup is an elixir. We baked a loaf of Garlic Cheese and Herbs Pull-Apart Bread to go with a soup that had all the vegetables we could find at home. The cheesy and herby bread with soup was quite a treat. Pull-apart loaves of bread are always interesting to bake. The joy lies in shaping the bread. In this loaf, we cut out round pieces of dough. Spread the filling and cheese. 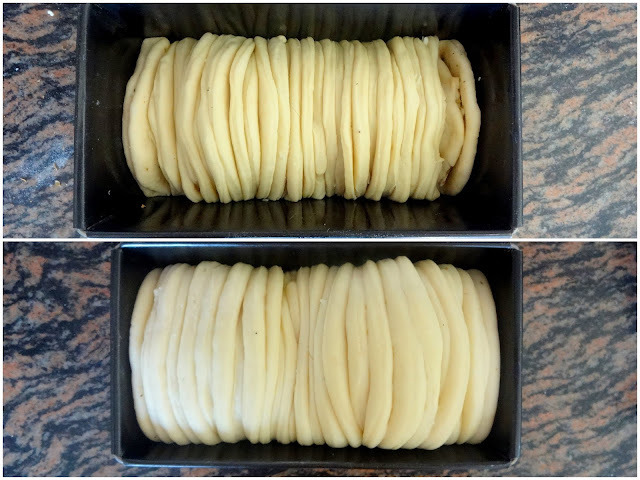 The rounds were folded and stacked in the pan. This process is not messy and the loaf looks neat and uniform. This gives a rounder and neater pull-apart loaf. Let the loaf rise until puffy. You may play around with the filling. 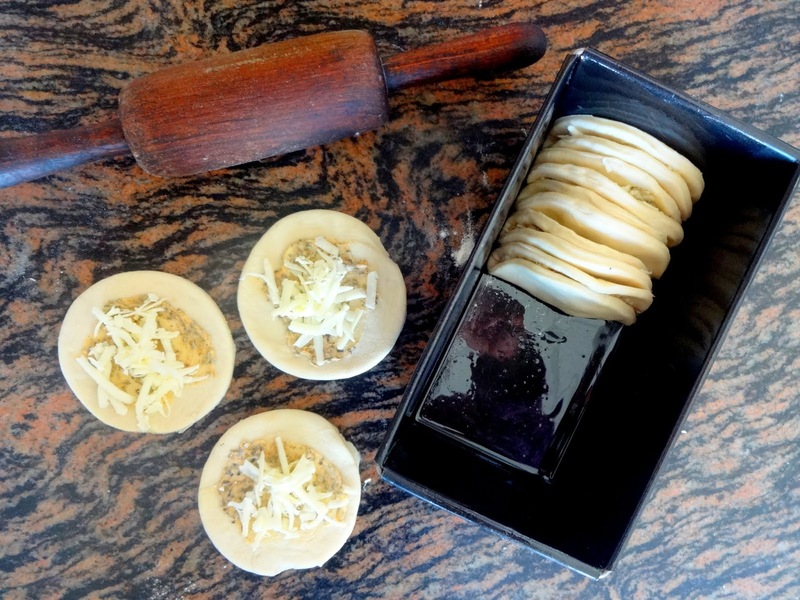 We made the filling with butter, garlic, herbs, and cheese. Take the last three ingredients in another bowl. Mix well. The sugar should dissolve completely and the butter should melt. If the milk is not warm enough, heat till done. Use milk mixture to knead the dough. Stir with a ladle until you get a shaggy dough. 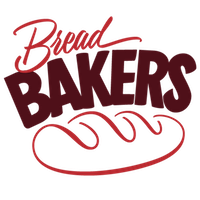 Transfer to a counter and knead till you get a very smooth, elastic and shiny dough. It should be a little tacky. Transfer to an oiled bowl. Turn around once so that the dough is evenly coated with oil. Cover and keep in a warm place until double in size. While the dough is in the last stage of rising, prepare the filling. Mix all the ingredients except cheese in a bowl. Keep aside. Grease one 8 ½ inches x 4 ½ inches loaf pan. Punch the risen dough. Divide into two equal size pieces. Roll out one piece on a lightly floured counter. Roll out evenly into a circle of about ½ inch thickness. 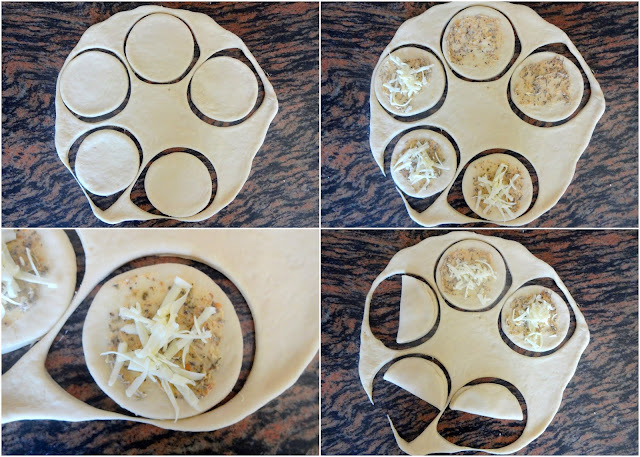 Use a lid, bowl or a large cookie cutter to cut circles out of the dough. Spread the filling in the half of each circle. Add cheese. Fold the circle in half and place them, round side up, in the loaf pan. Repeat with the remaining dough until the pan is full. Cover loosely with a kitchen towel and place in a warm place until puffy. Bake in a preheated oven at 180 degrees C for about 20 -22 minutes. The top should turn golden and the bottom of the pan should sound hollow when tapped. Tent with a foil if the top is browning too fast. Enjoy warm bread with hot soup. Your layers are so perfect! This bread is gorgeous, and I'm sure it's tasty! Yes to all those flavors. The loaf is so pretty, too! Such a gorgeous loaf! I agree that the round shape keeps it so much neater. I'll have to try that. Beautiful clicks of Spring. We are still waiting for spring to arrive in our neck of woods. That pull apart bread looks so soft and filled with flavor of cheese, herbs and garlic. This bread is definitely going on my to make list. Thanks. This would be delicious with a casserole! What a blessing it is to get a little glimpse into your world, Namita. 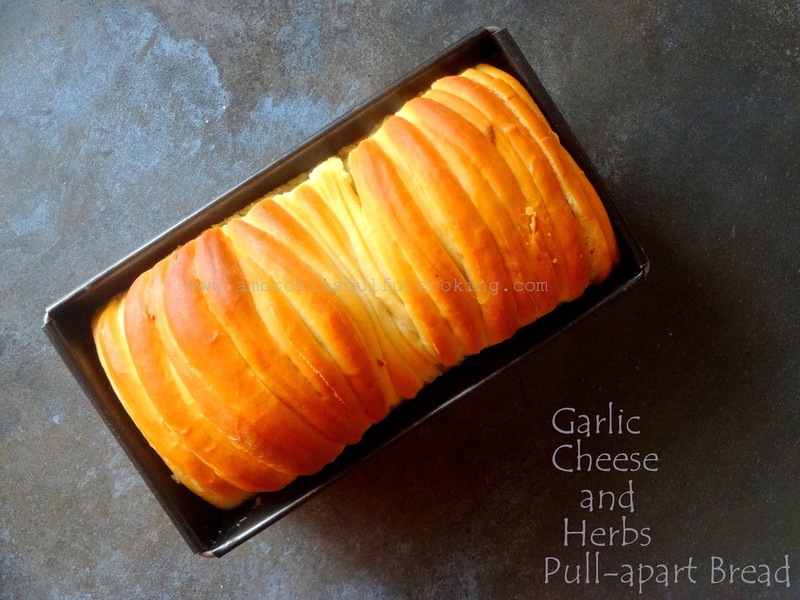 Your photographs are always stunning, including this garlic cheese pull apart loaf. What a beauty! 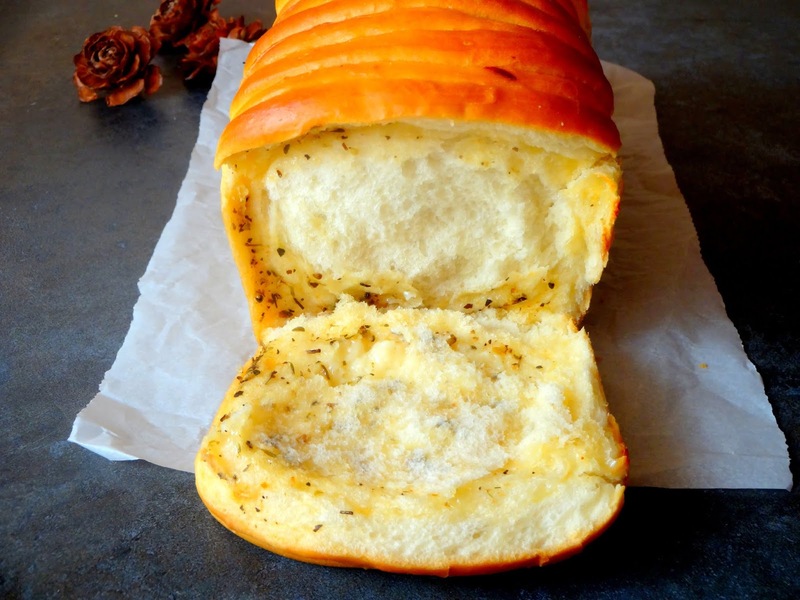 This is one of the best pull apart breads I have ever seen and with the cheese stuffed inside - looks so delicious! 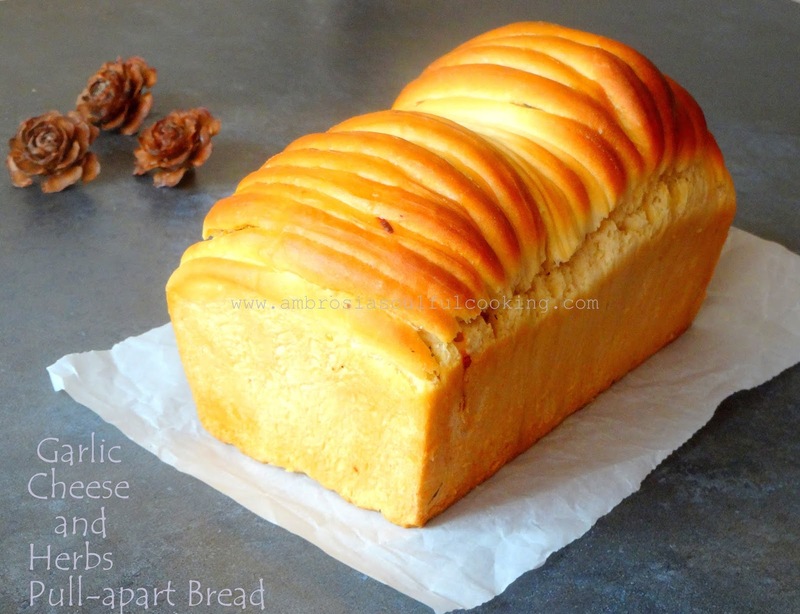 This loaf is so lovely 👍 will be trying soon.. The pics that you post are so beautiful and give a glimpse of nature around you, the bread also look perfect.